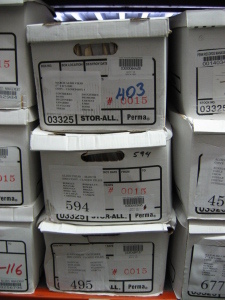 Only cartons intended for records storage will be accepted. Copy paper boxes, stationery boxes, equipment boxes will not be accepted. Lids must fit securely over the carton and cannot be torn or crushed. lightweight lids not intended to be stacked for long term storage. Penn drivers may refuse to pick up unsuitable cartons or advise the client that a repacking charge will apply. 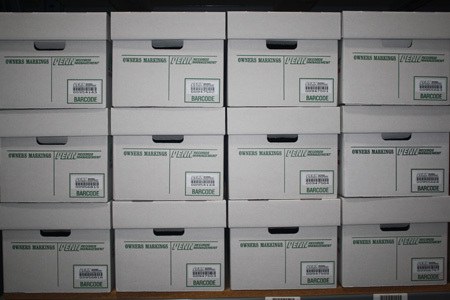 Penn Records Management encourages the use of PENN BOXES that are durable with lids designed to withstand crushing or collapsing when stacked. Our Penn boxes are very competitively priced lower than the office supply stores. We suggest ordering quality cartons provided by Penn Records. Not using quality cartons may result in damage to your files.